We are the manufacturer, and take full responsibility for the projectors, provide one year warranty for 100% satisfaction, as well as Customer Service & Technical Support. The X88+A android wireless projector support Airplay/Miracast/DLNA, you can cast the screen of your mobile phone to the big screen, whatever you do on the phone shows on the screen; besides, you can watch videos/sport events/ programs or play video games online via WiFi. 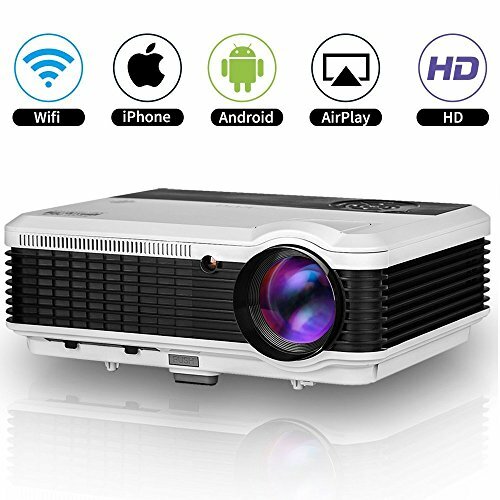 Valentine is coming, you can buy the WiFi projector as a surprise for your family, enjoy home cinema entertainment, gaming, camping and backyard movie nights together. 360 degree flip,±15˚ Manual Vertical Keystone correction. * For 3D, just support Red/Blue 3D movies, need to wear blue and red 3D glasses. * If you have any inquiry about the projector, pls feel free to contact us. 【Wireless and Wired Connection】Built-in wifi, connect to your iPhone, iPad, Mac, Samsung, LG, Moto, Android phones, tablet, laptop/pc via Wifi. Multiple interfaces: 2 USB, HDMI input, VGA, Audio, AV, TV, support smartphone, tablet, dvd/blueray player, ps3/ps4, xbox, wii, pc/laptop, roku, firestick, cable box etc. Comes with Free HDMI & VGA for quick connection. 【Big Screen, Eye-friendly lamp】Projection size: 50-200 inches, projection distance: 6.5-18FT, aspect ratio: 16:9, 4:3, enjoy n times bigger screen than your phone/ laptop/ tablet screen, relax your eyes. Ultra-soft led light source lamp, diffuse reflection projection light, unlike television direct light, you will not feel eyestrain after viewing, much healthier. 【LED Lighting and LCD Display】Adopt LED lighting technology, boasts 3600 lumens brightness, ensures great viewing for indoor/outdoor use; TFT LCD screen, no Rainbow Effect, high resolution WXGA 1280x800 native, almost twice SVGA (800X600) for vibrant images with precision color and detail. 16.7 million full colors, breathe life into every image. 【Expanded Storage, Multi-media】Android 4.4.4 with built-in Web Browser and APPs (Google store, KODI, YouTube, Facebook etc), large 8GB storage enables you to download massive apps from Google Play Store, surf the internet anytime. Plug and play (video, audio, image, txt files) via USB inputs, no PC needed, support 32GB USB drive and 1TB HDD. 【Easy To Use, Durability】Built-in 5W big power speakers, no need to use a speaker (if you prefer, add speaker directly via RCA audio out or via your pc). Front/Rear projector, offers ±15° vertical keystone correction, Zoom in and zoom out, 360° Image flip function, M4 screw holes for ceiling mounted. 50000 hours LED lamp. Warranty: 1 Year. 2-4 day Fast Delivery.